The service design process begins with the discovery phase: a focused round of formative research. We undertook a literature review of existing research, and conducted interviews and observation sessions with immigrants, immigration lawyers, financial counselors, and library staff. Understanding the different perspectives of our stakeholders helped us gain a systemic view of the issues and constituents. Financial literacy needs span the breadth of the citizenship application process: the 5+ years before a Legal Permanent Resident is eligible to apply for citizenship, the 6 months to two years to complete the application process, and the indefinite time period after one becomes a citizen. The naturalization and financial empowerment processes are complex and often difficult to navigate. Many people are unaware of the long-term financial benefits of obtaining citizenship. 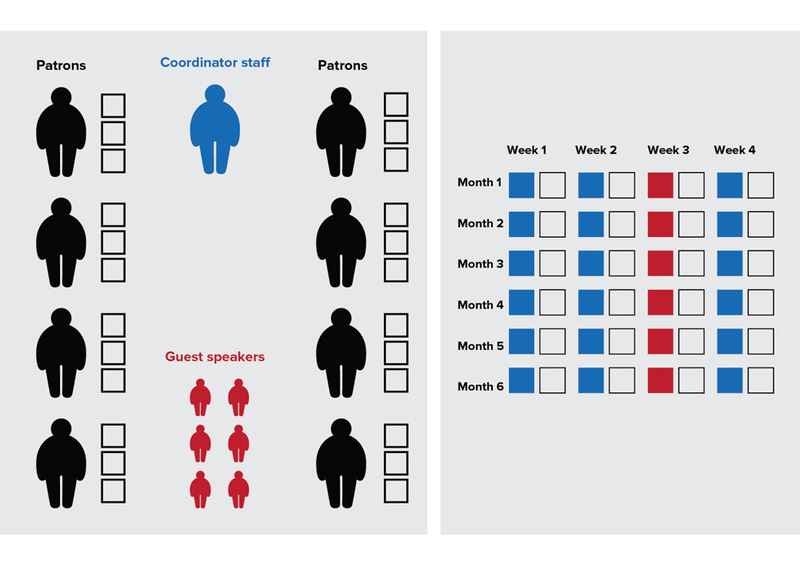 Libraries are spaces of (communal) learning and, therefore, a good place for the NYCitizenship program to engage with its target audience in coaching activities. Motivation and time are important factors for participating in any social service. Family, gender, and community factors play an important role in an immigrant’s integration into life in the United States. There are a number of barriers and stigma associated with seeking financial assistance and/or applying for citizenship. Our observations from the discovery phase led us to create a set of “personas,” which are profile sketches that reflect the different demographics and personalities that comprised our main audiences. 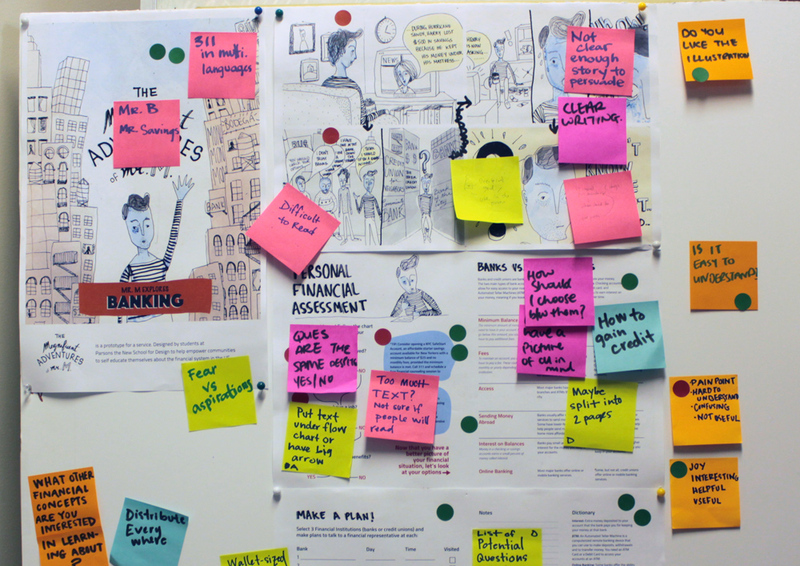 These personas enabled us to build journey maps that identify opportunities and pain points that these audiences might face, and to gather together precedents to help inspire the co-design activities. Stakeholder Map. A stakeholder map shows connections and relationships across all of the individuals and organizations involved in the service. Doing this helped us gain a systemic view of all the organizations and actors involved in the NYCitizenship and financial counseling programs. Illustrating this information helped us tap into the existing network and knowledge to gain insights and feedback that would advance the project. The stakeholder map below shows the interconnections between citizenship and financial services at Brooklyn Public Library’s Central Library, one of our investigation sites during the discovery phase. The journey map illustrates the process that a typical example of a Lawful Permanent Resident (LPR) might go through to become a citizen. Visualizing this journey helped us to see that there were three distinct time frames in becoming a citizen: the 5+ years before an LPR is eligible to apply for citizenship, the 6 months to two years to complete the application process, and the indefinite time period after one becomes a citizen. We learned that one of the major connections between applying for citizenship and finances is the citizenship application fee. However, there may be other opportunities as one applies for citizenship to make financial connections—ensuring that one’s taxes are paid, for example. This became a key insight for us, and informed later stages of the project. Design personas are fictitious, yet representative archetypes or characters that embody key attributes of people in the service user population. Through our research, we learned that there are key differences in people’s priorities, motivations, values and decision-making processes when it comes to applying for citizenship and seeking financial empowerment services. These differences were reflected in our three distinct personas: Responsible Rita who is prepared and educated, though nervous about her language skills; Single Samih who works long hours, lives paycheck to paycheck, and is nervous about talking to people; and Mixed Manu who is anxious and worried because of his mixed status family. Using the personas helped us to make sure that we were considering our diverse audiences. We researched and identified 10 project case studies that had similarities to this project and that might provide some best practices and inspiration. The discovery findings provided the basic understanding of the system, the conceptual directions, and the design principles for the co-design phase, the initial period of open-ended creative work. At the start of the co-design phase we decided to organize ourselves into three teams to develop different possible directions. We started by brainstorming ideas that connected citizenship and financial counseling services based on the needs of the different personas. From these ideas, each team honed in on three of their best design concepts, further fleshing out the ideas and describing them in detail. Working together with the Mayor’s Office of Immigrant Affairs, we reviewed and sought feedback on each of the nine concepts thoroughly to assess the overall potential and feasibility of each idea, including which ideas might integrate best with the evolving NYCitizenship program framework. Based on this feedback, four of the most promising initial design concepts were selected for further testing and development. What it is: Inspired by the utilitarian and private interfaces such as ATM machines, the New Americans Kiosk is a multilingual kiosk with a printer. How it works: The kiosk runs an initial, private diagnostic of the LPR’s financial health. With an easy-to-use interface and an option to print the report, LPRs can walk away with a personalized set of information from a private interaction in their own language. What it is: A service that encourages informal networks and peer-to-peer learning on issues related to citizenship. How it works: People who have successfully navigated the citizenship process can become community leaders to co-lead informal gatherings at the library with citizenship and financial experts. In this informal setting, they will conduct group problem solving sessions, and work towards citizenship and financial stability simultaneously. What it is: A deck of cards that structures conversations about planning financial steps within the citizenship process. How it works: The cards guide LPRs to learn financial skills and resources that will help them become successful U.S. citizens. It does this by using the immediate goal of citizenship to show the relevance of financial management in the LPRs lives, and create a concrete plan to move forward. 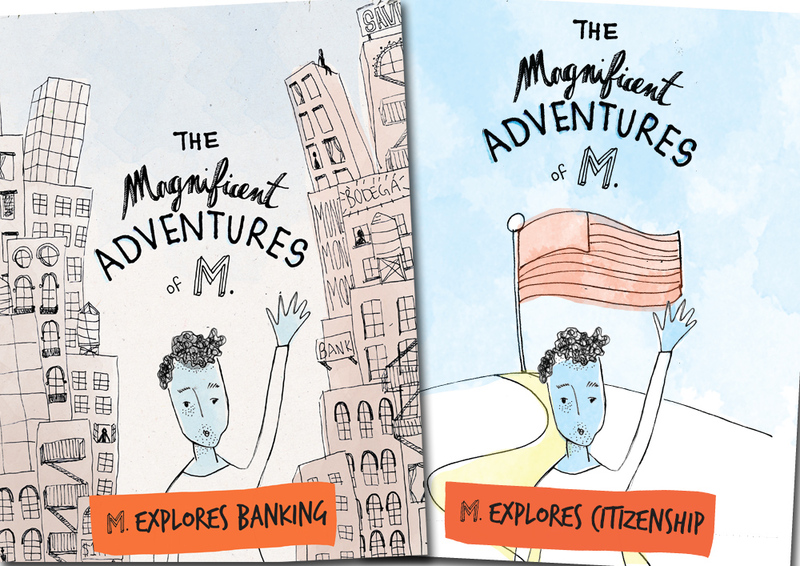 What it is: A comic series that uses visual storytelling to break down and simplify various financial and citizenship-related concepts. How it works: The comics are designed to be an engaging tool for learning. The content is intentionally objective and designed to empower people to learn about different topics related to citizenship and finances in a digestible format, allowing LPRs to fully understand a concept, connect with related resources, and make their own decisions. It is not a tool that tells people what they should or should not do. 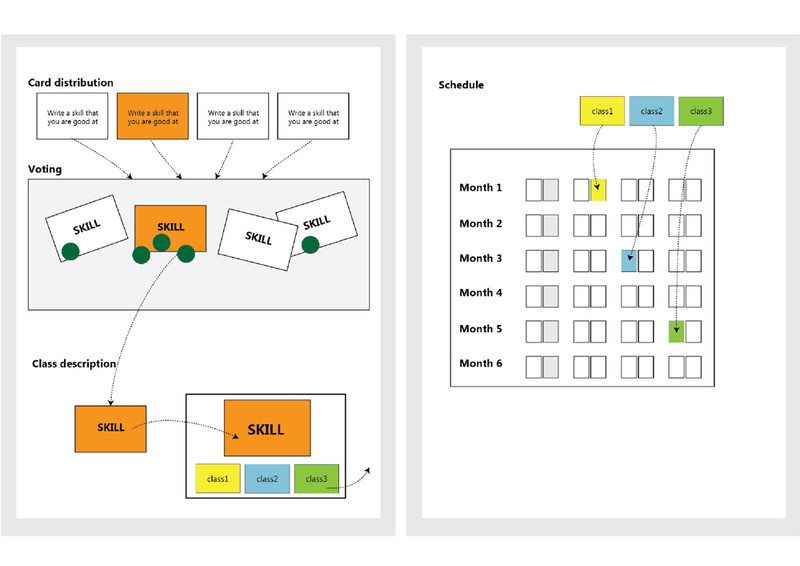 In service design, prototypes are mock-ups – physical or digital -- that represent, in limited form, key aspects of the service design concepts so that they can be tested in the real world. Condensing the elements of each concept that most define the user experience, we crafted prototypes of the four designs to help evaluate and refine their concepts. We then conducted field tests at library branches with potential users of each prototype in order to garner feedback from users similar to those who would be expected to interact with the proposed designs in their full implementation. This user feedback was an essential element for guiding the remainder of the design process. The findings from the prototyping phase were used to further refine the four service design concepts which were presented in a work session to nearly 20 participants, including members from the Mayor’s Office of Immigrant Affairs, the Office of Financial Empowerment, Citi Community Development, representatives from New York’s public library systems, and others. In addition to the physical mock-ups, we created a variety of supplemental documents such as instruction guides, scenarios of use, service roadmaps, brand standards, evaluation metrics and roll-out plans detailing the prototypes’ potential implementations. Each concept also had a corresponding service design blueprint--a visual illustration of the processes, structures, and actions for the users, providers, and supporters throughout the service timeline. The conclusion of the prototyping phase coincided with the 2015 National Immigrant Integration Conference where the Mayor’s Office of Immigrant Affairs hosted a panel discussion highlighting the NYCitizenship program, the prototypes, and a range of successful stories in the area of immigrant financial empowerment. The panel gathered over 100 participants from cities all over the country, indicating a broad-based interest in this topic and in New York City’s innovative approaches. Panelists and attendees engaged in a lively discussion that focused on the challenges and best practices in integrating citizenship with financial empowerment programming. Based on input from our partners at the library systems, financial empowerment providers, and staff from the Mayor’s Office of Immigrant Affairs, and after multiple rounds of iteration with clients, we realized that to introduce these new ideas and tools required a new and integrated touchpoint at the very beginning of the citizenship application process. To that end, we decided to design a new information session as the cornerstone to introduce the newly designed NYCitizenship process for prospective clients, guide them through these different steps and help them make the connection between citizenship and financial empowerment. With that in mind, we tasked ourselves with creating a pilot for the info sessions. To provide individuals with basic information about the U.S. citizenship application process. To identify the need for financial empowerment services in connection with the process of becoming a U.S. citizen. To explain the services available through NYCitizenship. To make appointments for NYCitizenship legal and financial counseling services. To prompt potential clients to organize relevant information and documents before they arrive at their first citizenship appointment to increase service efficiency. The information session has been designed to help NYCitizenship attorneys guide participants through the process of applying for citizenship. 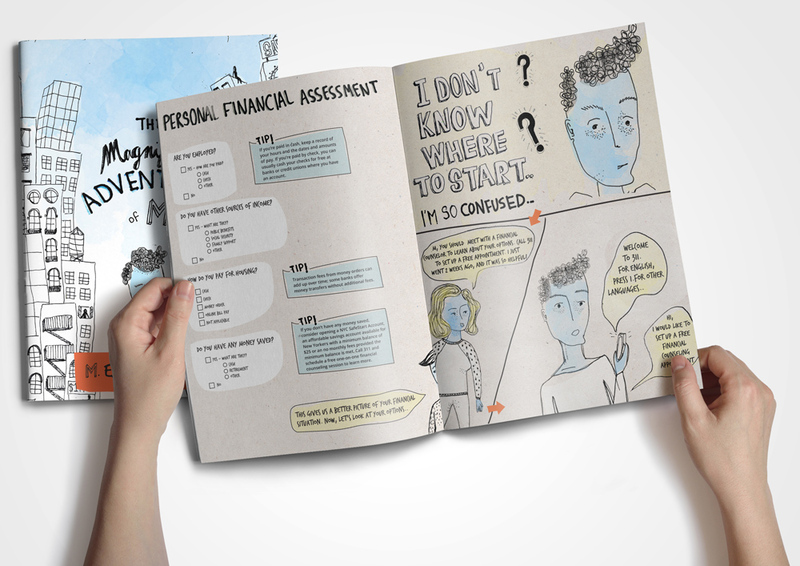 To facilitate this process, we created a workbook with a narrated video that helps clients understand how citizenship and financial empowerment services are connected. 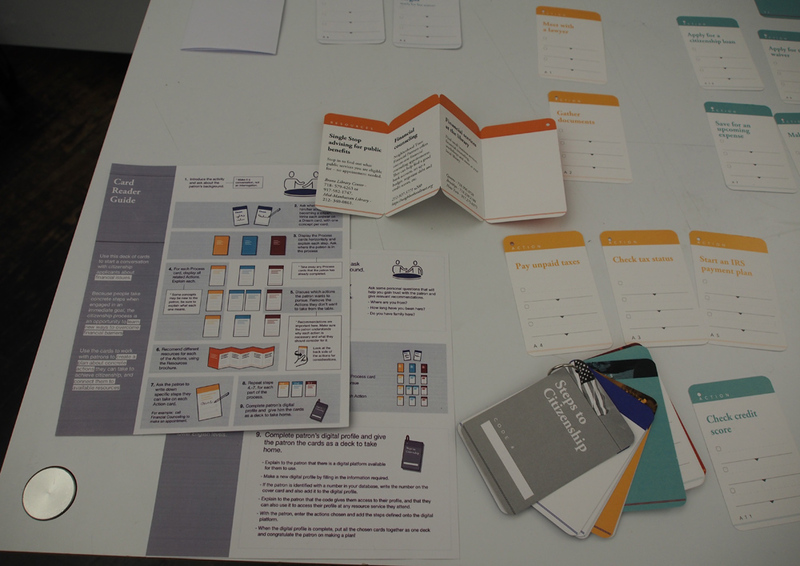 The workbook and video are heavily influenced by the Steps to Citizenship cards in their structure, but also incorporate elements of the Comics in its narrative style and self-guided approach. 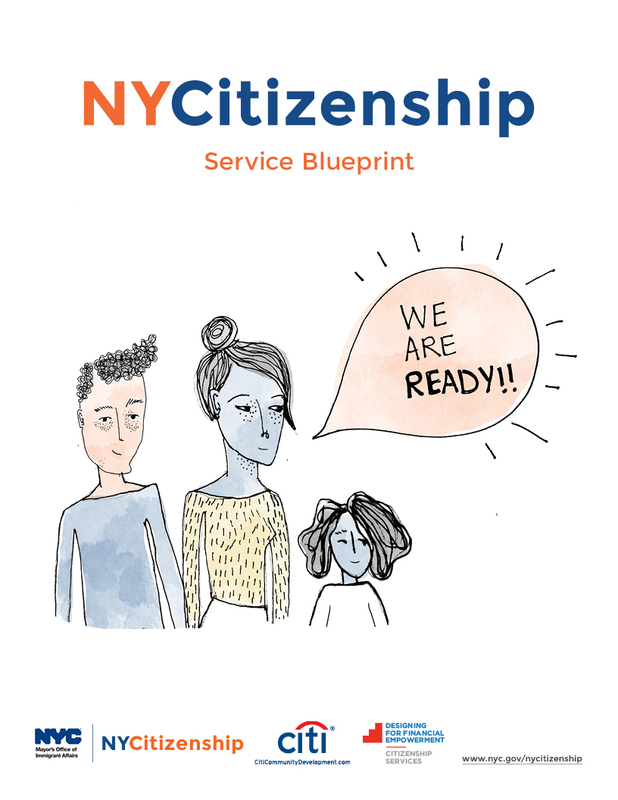 The workbook breaks down the process of applying for citizenship into five interactive sections, each of which contains related reasons for which a participant may consider taking advantage of NYCitizenship’s free financial counseling services. 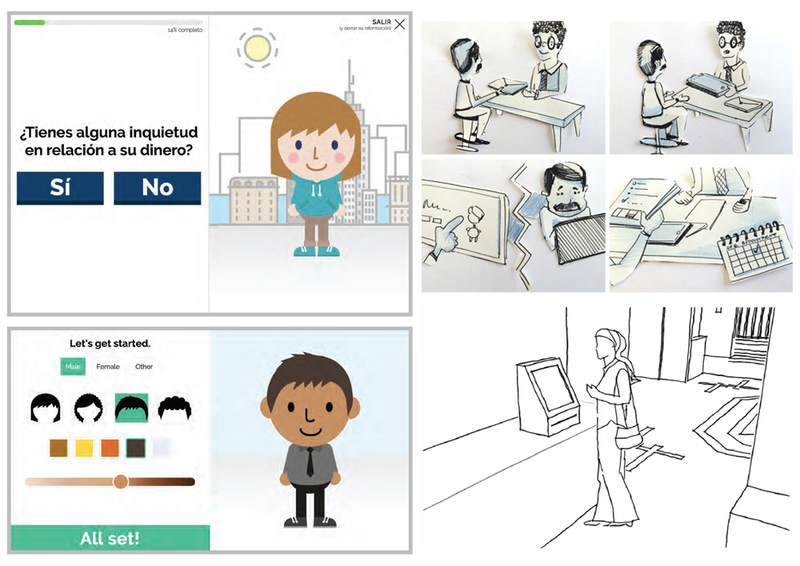 Each section of the workbook has a corresponding one- to three-minute video in which the original comic characters--recent US citizens, themselves--serve as guides for the participants as they complete their workbooks and make the connections between citizenship and financial empowerment. Additionally, we created a facilitation guide to help walk the attorneys through the process of using the materials during an info session, as well as branded pens, bookmarks, sign-in sheets, and additional marketing materials. We also enveloped the workbook with a folder to allow program participants to gather and store their citizenship and financial counseling documents in one place, after hearing feedback that many individuals are prone to misplacing or losing their important documents. Workshop facilitators received a customized packet of materials to help them lead citizenship workshops: a service blueprint, 16-page Facilitator's Guide, pens, a pen bag, promotional bookmarks and fliers, thumb drives that have the NYCitizenship video loaded on it (also viewable below), a 8-page Citizenship Guide for workshop participants, and a NYCitizenship bag to transport all of the materials.